Many of my clients have been calling me, shocked at how rapidly home prices have risen over the last year and questioning whether the South Florida real estate market is entering a new bubble. Although this graph confirms that prices have gone up, we are a long way off from the peak. Given that we arrived at inflated pricing due to speculation, easy and bad mortgages, and fraud, I think we will stay off the peak for quite a while. The reason for our current rise in prices is due to a lack of inventory. Many homeowners who bought at the peak are still under water and will be for quite some time; foreclosures and short sales have been slow to work through the backlog; there are investors with large amounts of cash looking at real estate; mortgages are still difficult to get; and appraisals have been off of what buyers with mortgages are offering thereby keeping owner/occupiers out of the housing market. Now that builders have started to construct new homes and buildings, inventory should start to creep up again. Based on the Miami Herald’s Economic Time Machine in the July 1 Business Monday, at the current pace of value increases, we won’t hit a new peak until July of 2018.
so intelligent. You understand therefore significantly in the case of this topic, made me personally consider it from numerous varied angles. except this paragraph is really a pleasant article, keep it up. Off 43% From 2006 Peak | ILoveSoFla.com is kinda plain. what if you added a little content? I mean, I don’t wish to tell you how to run your blog, however what if you added something that makes people desire more? 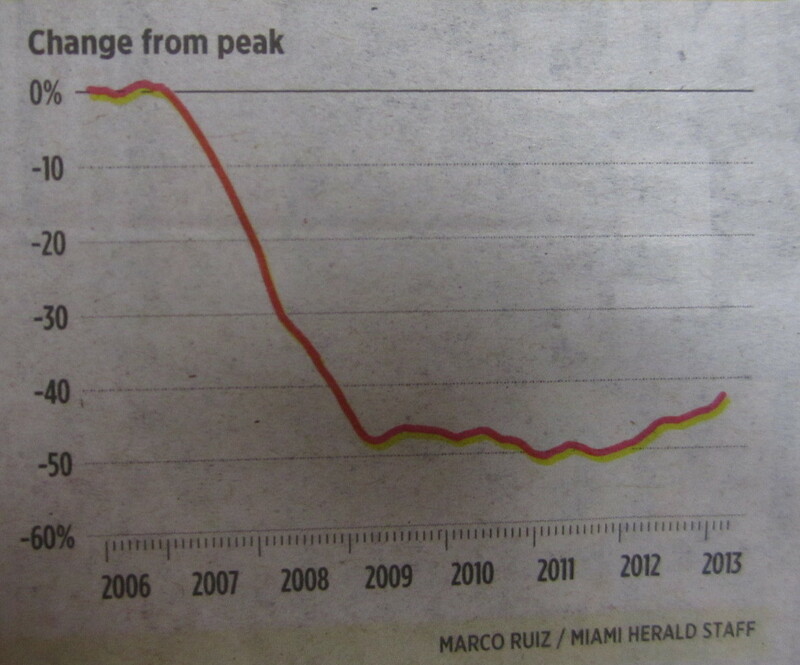 I mean Home Values Up But Still Off 43% From 2006 Peak | ILoveSoFla.com is kinda boring. You might peek at Yahoo’s home page and note how they create post titles to get people to open the links. Hi there Dear, are you truly visiting this website regularly, if so after that you will definitely get fastidious knowledge. I visited various web sites but the audio quality for audio songs present at this site is actually superb. Your way of describing all in this article is really nice, all can simply know it, Thanks a lot. I surprise how much effort you put to create one of these excellent informative site. web site, and article is really fruitful in favor of me, keep up posting these articles. For hottest news you have to go to see world wide web and on the web I found this site as a finest site for most recent updates. to read this webpage, and I used to pay a quick visit this web site everyday. of this web site; this weblog includes remarkable and really excellent data in support of readers. which includes lots of useful facts, thanks for providing these kinds of information. I am glad to seek out a lot of helpful info here within the publish, we need develop extra strategies in this regard, thanks for sharing. picked up something new from right here. I did however expertise some technical points using this website, since I experienced to reload the web site many times previous to I could get it to load correctly. I am taking a look ahead for your next put up, I will try to get the hold of it! actually one thing that I feel I’d never understand. posts. Any way I will be subscribing on your augment or even I achievement you access constantly fast. I read this article fully on the topic of the resemblance of newest and preceding technologies, it’s awesome article. I am in fact thankful to the owner of this site who has shared this enormous piece of writing at here. Hi, yup this paragraph is genuinely good and I have learned lot of things from it regarding blogging. Hurrah! At last I got a web site from where I be able to really get valuable data concerning my study and knowledge. am having difficulties with your RSS. I don’t know the reason why I am unable to subscribe to it. It’s awesome to pay a visit this site and reading the views of all colleagues regarding this paragraph, while I am also zealous of getting familiarity. this web site conations truly fastidious funny data too. getting familiarity all the time by reading such nice posts. https://v.gd/lyjEMi -I couldn’t resist commenting. Well written! some attention-grabbing issues or suggestions. Perhaps you could write subsequent articles regarding this article. Great site. Plenty of useful info here. I’m sending it to some buddies ans additionally sharing in delicious. working hard for his web site, for the reason that here every material is quality based data.